The community regeneration company Keepmoat has had its planning application to Gedling Borough Council approved for the development of 1,050 homes just off Arnold Lane, Gedling on the site of the former Gedling Colliery. This new estate will border Gedling Country Park (to the south) and will also eventually include a new primary school, retail outlets, medical centre and open spaces. An updated planning application was made in 2017 with amendments to phase 1 (the first 110 homes). Please click here to view this amended planning application (opens in new window). You can also click here to view the original 2015 planning application (opens in new window), which includes lots of detailed plans and diagrams, some of which are now outdated and have been superseded by the 2017 application. The existing Arnold Lane is shown just underneath the new housing estate - running top left to bottom right - with Mapperley Plains towards the left and Gedling Village towards the right. The new Gedling Access Road (GAR) is the curved road with the two roundabouts shown at the top of the new housing estate in the diagram above, just below the country park. The roundabout shown top left will join the new GAR to the existing Arnold Lane. The bottom part of Lambley Lane is shown at the right edge of the diagram - with the junction at Arnold Lane just visible at the very bottom (with a bit of the Sainsbury's Express building just shown). Lambley Lane Recreation Field is shown between Lambley Lane and the new estate ('Existing Sports Fields'). The new estate will be a mixture of 2, 3, 4 and 5 bedroom houses and 2 bedroom apartments and will be built in two phases: with phase one being the first 506 dwellings and phase two being the remaining 587 dwellings. Phase one commenced in mid 2017. The entrance into the estate is just off Arnold Lane where the old colliery entrance used to be (and where the waste and recycling site was for a few years). The Gedling Access Road will commence construction in late 2018 and is due to be completed in early 2020. This will include two new roundabouts, which will provide two new entrances into the estate to allow phase two to proceed. 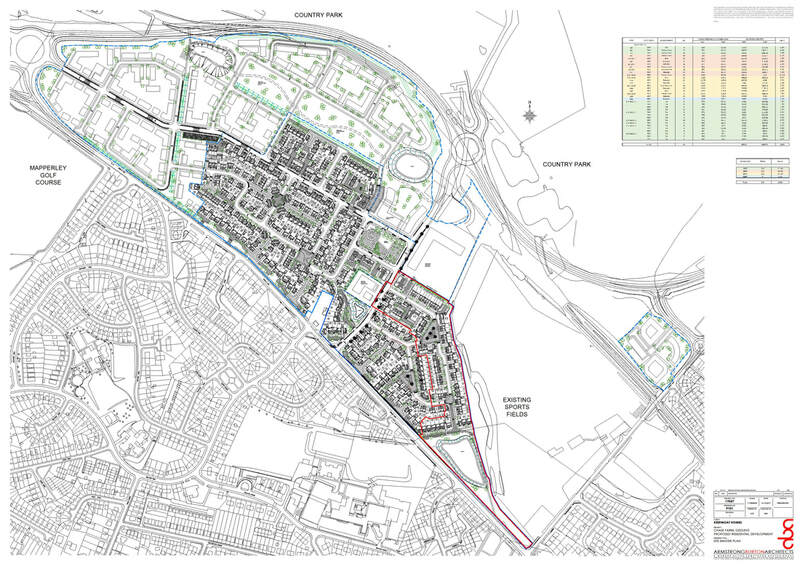 Keepmoat's planning application states that only about 300 homes will be built prior to the GAR being completed. This is in order to ensure that traffic levels on Arnold Lane as a result of the new development are not increased unduly prior to the relief offered by the GAR. The GAR will provide significantly more traffic capacity and be a bypass for Gedling Village. This will then allow Keepmoat to complete phase one and start phase two from about early 2020 onwards. Keepmoat is required to contribute towards the cost of the Gedling Access Road and in addition, a one-off Community Infrastructure Levy payable by Keepmoat to Gedling Borough Council is expected to contribute towards the cost of the visitor centre within Gedling Country Park. Two new high quality pedestrian entrances will run through the new Keepmoat estate across the Gedling Access Road (via new pedestrian islands) and into the country park. These pedestrian routes are shown as yellow dotted lines in the diagram above and will provide much needed pedestrian access for the residents of Gedling, Carlton and Mapperley into the country park. Please see http://www.gedling.gov.uk/planningbuildingcontrol/planningdevelopmentmanagement/communityinfrastructurelevy/ for more information about the Community Infrastructure Levy (opens in a new window). The 'CIL Charging Schedule' document included on this web site includes information about how this money is proposed to be spent by Gedling Borough Council. The Friends of Gedling Country Park have already started a dialogue with Keepmoat and one of the activities that they may be working jointly on over the next couple of years will be on the 'translocation' of any rare or special flora and fauna from the housing estate site into the country park in order to preserve it, prior to the construction work starting. We will keep you updated on these activities on this web site. We also hope to help Keepmoat with the planting scheme in the new estate and in particular to choose native species that are compatible with and complementary to the trees and flora in the country park. Please also see our page regarding the 150 homes being developed by Bloor Homes just off Spring Lane, Mapperley.